This delicious quiche is the perfect Christmas Morning Recipe for you and your family! It is savory, delicious, and also festive looking! You can make this easy recipe the morning of, or the night before, and reheat to save time. Oh, and did I also mention that this is a Christmas Morning Recipe Blog Hop?! Be sure to check out these other amazing recipes at the end of this post! A little fall here, a little fall there, 2016 Fall Home Tour! Welcome to my home! This is actually the Project Pile’s very first fall home tour — ever! Fall is my favorite season decorating-wise, (and winter is, snowmobiling-wise! )… So I’m very excited to share this post with you! This is the backyard, and as you can see, the leaves are just starting to turn… Maybe another week and they will be all ready?! Then we can rake and jump in them! And here is my actual home… Come on in! Here is my antique wagon wheel, and a few of my antique bottles that have been collected on my family’s 180-year old farm, over the years. And here is my antique milk-can, also from the farm, and an antique ladder, from that area. You can check out my full front porch décor here: A Rustic Fall Front Porch, using Some of my Favorite Antique Pieces! A few hand-painted and real pumpkins there! You can see my full buffet décor, and learn how I put this look together, here: A Quick & Easy Fall Buffet Makeover! Now let’s mosey on down to the living room! Sorry, the lighting is a little more than off, in here… I love my big, beautiful front porch, but it really seems to hamper the photo-taking quality in this room… Oh well, what can you do?! All I did here, was switch out my regular white rose garland for some leafy-red sunflowers, and then hung a very simple wreath in the middle. Very colorful, and yet a really, really, simple update for fall! These are my chickens! I actually stole these from my mother! I love them so much, they stay out all year, no matter the season. All I did here to dress them up for fall, was switch out the flowers in my faux flower box for some fall colored ones. I did the same thing for this side-table… just added some more rusty-colored flowers for fall, plus my deer head! Oh, and a few cutesy, little pumpkins too! Let’s head to the kitchen now! Again, just some very simple fall season updates in here! Plus a few wicker pumpkins there! Oh – and let’s not forget my 2 second kitchen table centerpiece! All I did here, was take the leaves off of an old fall garland that I had kicking around, and stuff them into this transparent vase… Doesn’t get much easier than that! OK… are you ready for my fall bedroom décor?! I really hope you enjoyed this “a little fall here, a little fall there,” 2016 Home Tour! Thanks for stopping by the Project Pile! Come on in! Welcome to TheProjectPile.com’s Christmas Home Tour — In fact, welcome to our very first home tour, ever! 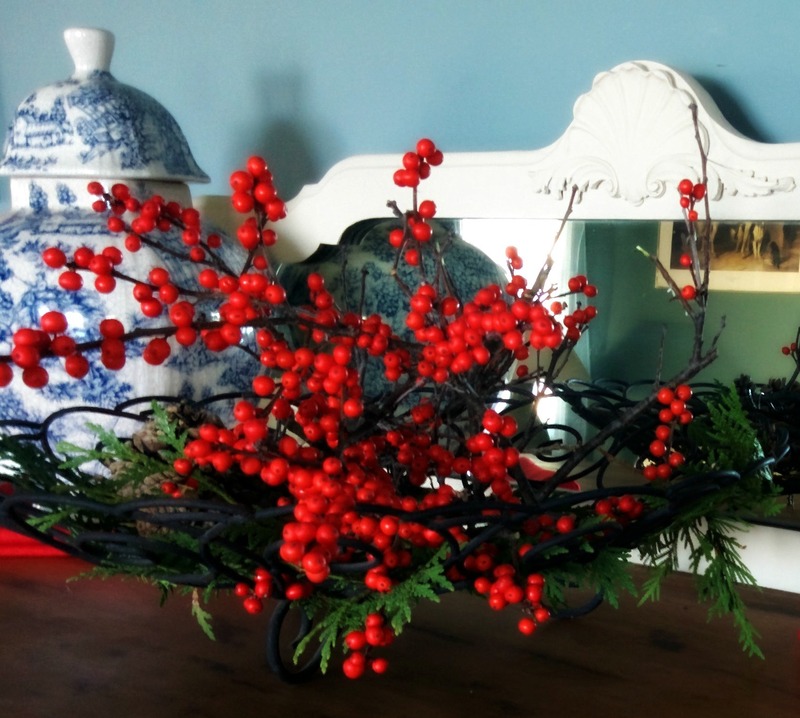 If you are looking for something extremely extravagant and done up to the “nines”, this may not be for you… Most of the Christmas Decor within our home has either been up-cycled from previous years, found in the backyard (Nature Things — Yah! ), or it came from the good ol’Dollar Store! 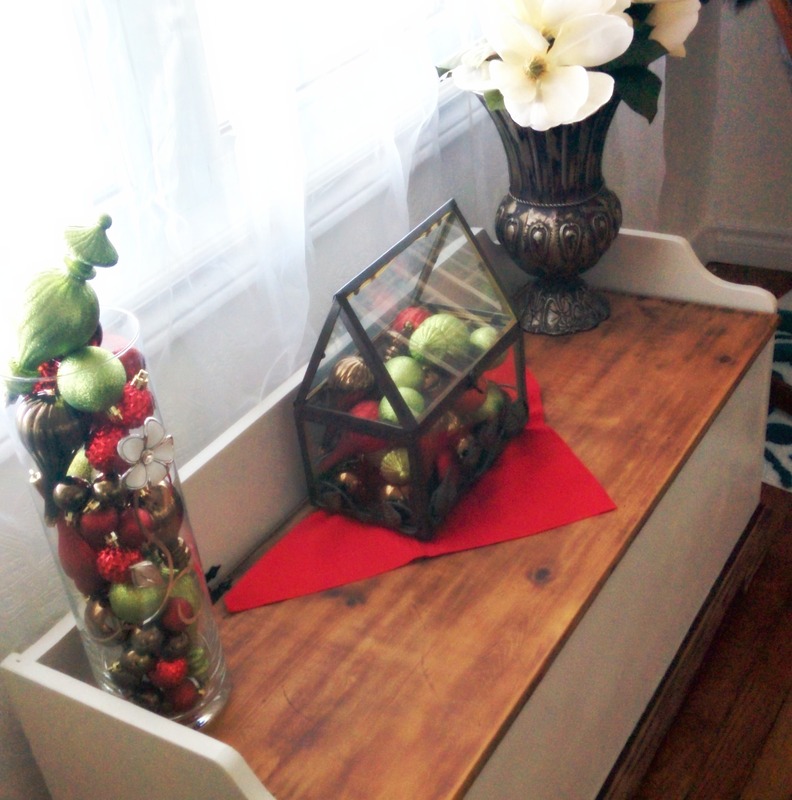 With pops of red here, and a sprig of greenery there — I hope you enjoy! This super-cozy, yet simple corner, is my favorite place to sit and read a magazine, or just take some time out of my busy day to relax. Believe it or not, this solid-wood rocking-chair came from a thrift store for 25 dollars, and is totally one of the best 25 dollars that I ever spent! I used a faux fur blanket and a hand-made burlap pillow to make this area soft and comfy! 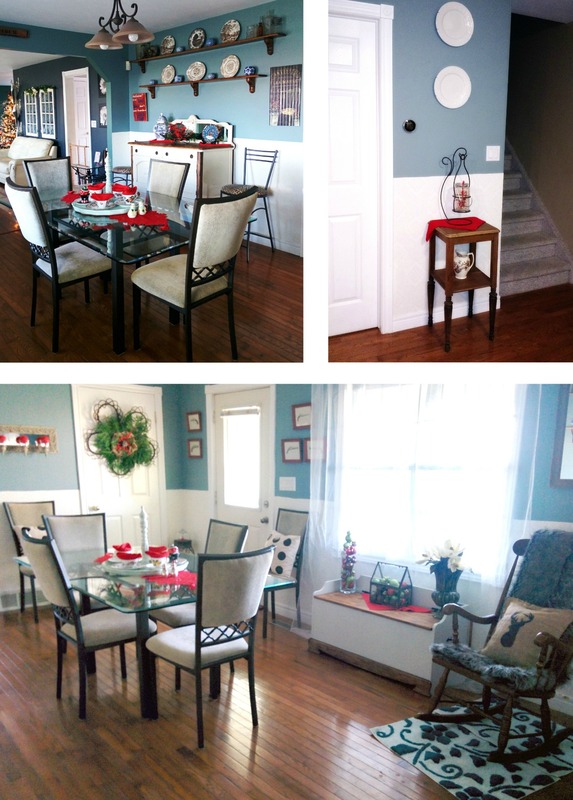 To “Christmas-Up” this area, I simply recycled last year’s Christmas Decor by placing the Christmas ornaments into the clear glass holders, that would normally house my regular dining room decor. Such a simple concept, that adds the perfect combination of Christmas and “Sparkle” all in one! I purchased one bunch of “Fresh Winter Berries” for 13 dollars, and look at the result! A sprig here and there, totally ties the room together! I’ve had these little snowman salt and pepper shakers for a coupe of years now, just sitting on the top of my microwave — shoved to the back, where nobody could see them… and I must say, they are my favorite piece of decor this year! My lovely nephews gave us this adorable “Joy, Joy, Joy” (one of the songs that they always sang when they were little! 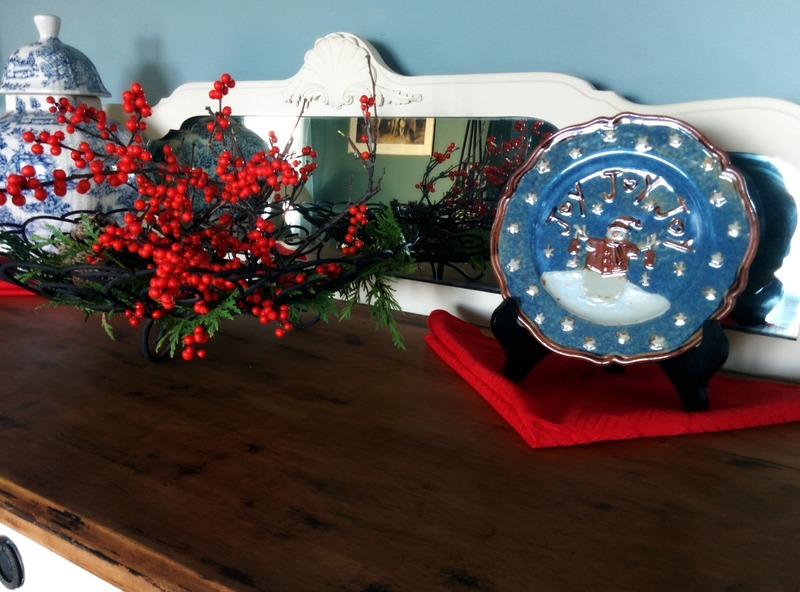 ), Snowman Plate (sorry, it’s kind of hard to see with the way the light is reflecting!)…. It is the perfect finishing touch to my hutch decor. A Sneak-Peek of my Christmas Decor! 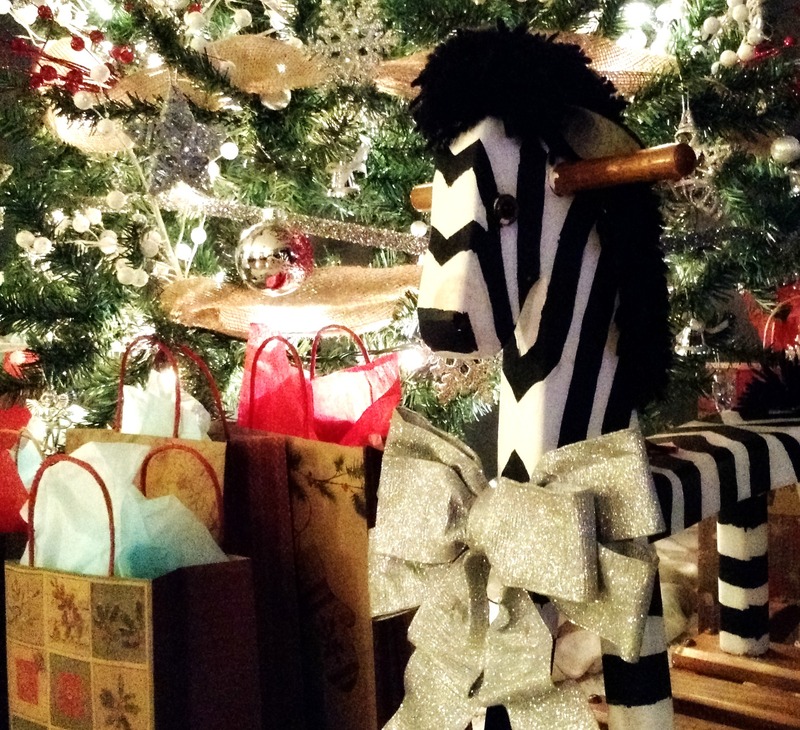 Oh boy, Christmas decorating with a crazy-busy toddler around, ahhh…. not so easy! LOL… But a lot of fun!